The company Feuchtmann active in Germany since 1992 has always been involved in the creation of educational and creative high quality games. 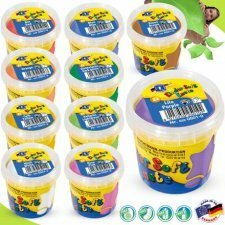 The colors and modeling paste correspond to European safety standards EN 71 1-9 on toy safety, carry the CE mark and are suitable for children from 3 years old, are made with ingredients diet by and usable by those who suffer allergies, are also gluten-free. 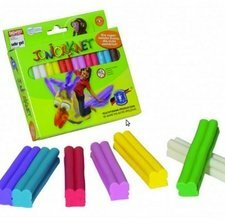 Klecksi finger paints are an educational toy causing no danger to health. They are easy to wash off the hands using soap and water. Soak soiled clothing as soon as possible and then wash normally. 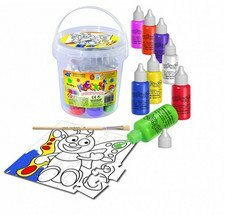 Klecksi finger paints cannot be completely removed from all fabrics and all varnished surfaces. Children under the age of 3 must be supervised by adults. Contents: 4 jars of 150 gr each. Please stir before use. Gluten-free (does not contain flour), protein-free, peanut-free, lactose-free. 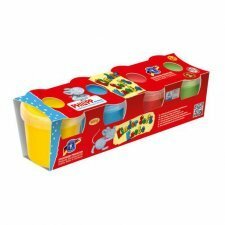 Farm soft play dough - 8 pots with wide-ranging accessoires. Contents: 8 pots of 80 gr. each. Colours: blue, red, yellow, green, white, pink, orange and brown. 6 plastic molds and various modelling tools. Pasta da modellare in 100% cera d'api e colori derivati da piante. 10 stecche. Gr 150. Prodotto in Germania. 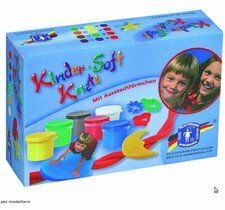 The good soft modeling clay for children from the age of 3, which never hardens. It consists of harmless, controlled and tested ingredients and is easily cleaned from work surfaces and hands. Any residue left of the table can be easily removed with another piece of clay. 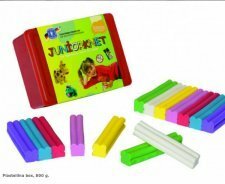 Contents: 14 sticks colored (purple, blue, red, pink, yellow, white, green) - total weight 800 Gr - packed in a plastic top box. Gluten free (without flour), protein free, peanut free, lactose free. 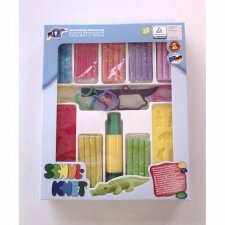 Modelling kit, easy to mould, doesn't dry out can be used for a long time. Hand kneading makes the clay soft and malleable. 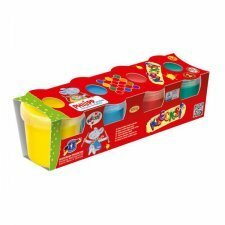 Modeling dough suitable also for children who will be able to develop their motor skills. The dough in bright colors is made according to the tradition of the Feuchtmann recipe from harmless raw materials for health. It can be molded, air dried, mixed and painted. The jars are packed in a beautiful cardboard box. 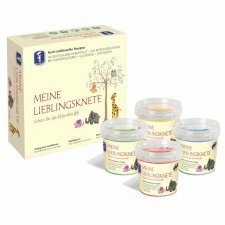 Contents: 4 jars of 150 gr each (yellow, red, blue and green). 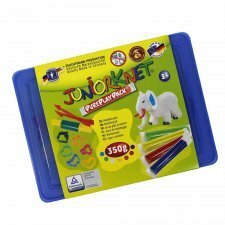 8 water-soluble paints 30 gr each (green, white, blue, red, orange, pink, violet), paint brush and puzzle. Box dimensions: height approx 13,5 cm - diameter approx 12,50 cm. 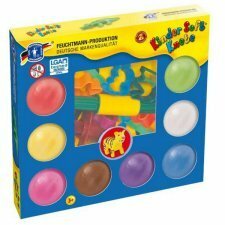 Soft play dough availble in several colours. 1 pot of 150 gr. Available colours: purple, red, orange, white, light green, dark green, blue, yellow, brown, pink. Children's play dough only contains ingredients that do not constitute a health risk. Kneading the play dough makes it soft and pliable, and you don't end up with a dirty table or messy hands. Play dough can easily be brushed out of textiles once it has dried. After play, seal in an airtight container of bag. If the play dough dries out, add a teaspoon of water and leave for 12 hours. Then knead thoroughly. This process can be repeated 5-6 times. Contents: 6 pots of 150 gr. each. Colours: blue, red, yellow, green, white, brown. 3 plastic molds (heart, fish, star). Not suitable for children under 3 years of age. Choking hazard due to small parts that can be esily swallowed! 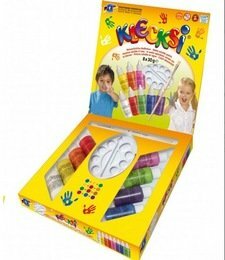 The finger paints Klecksi are the colors that you can touch. 1 bottle of 30 grams in the colors (purple, white, green, yellow, blue, red, pink or orange). 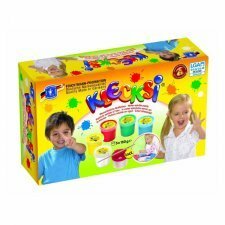 Klecksi paints are an educationally valuable toy, which can easily be washed from hands with soap and water. Quickly soak stained clothing and then wash normally. Important: Klecksi paints cannot always be removed from all materials or from all coated parts without trace. Shake well before use. 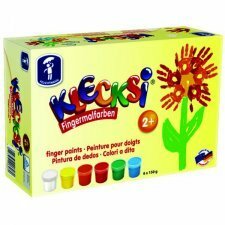 The finger paints Klecksi are the colors that you can touch. 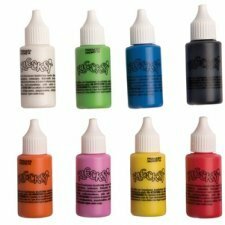 Pack of 8 bottles of 50 grams each in the colors (yellow, orange, pink, white, red, green, blue, purple) + wooden brush. Contents: 4 pots of 150 gr. each. 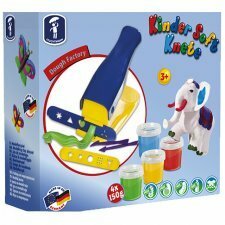 Colours: blue, red, yellow, green, 2 modelling tools, 1 press. Contents: 5 jars of 150 gr each (white, yellow, red, green, blue) + 1 paintbrush + 1 brush cup. Please stir before use. Contents: 6 jars of 150 gr each. Please stir before use. Contents: 4 pots of 150 gr. each. Colours: blue, red, yellow, green. Use the rolling pin supplied to roll the modelling paste out to the required thickness. Push your child's hand gently into the paste and if required use the supplied tool to make a hole for hanging the cast up - then leave to dry for 24 hours. Contents: 1 pot of paste (150g), 1 rolling pin, 2 tools. The paste is available in: white, pink or blue.